Monaco in area aspect is second smallest country in the world after the Vatican and one of the densely lived – approximately 33000 inhabitants on 1, 95 km2. It’s in France Riviera, between France and the Mediterranean Sea, near Italy. Monaco is constitutional monarchy. Grimaldi dynasties representative still lives in castle and rules this small country. Nowadays every interest can visit this castle, view luxurious halls, with audio guide help can hear not only a story about this castle but even prince welcome saying for every his castle visitor. Castle hall walls are decorated with Grimaldi dynasty portraits. Talking about nowadays monarchs and looking at all the family, I haven’t seen another so beautiful and noble human family like they – light, majestic, burned, with classical face traits. It’s a pity that in the halls it’s forbidden to take photography’s, as like to sit on one chair, which is portrait gallery. There were guards, who followed for that, but they were very nice. King made a park with different exotic plants, trees and sculptures. It’s open for every city visitor. Beside the park is Monaco Oceanography museum, who’s one of its makers and leaders was world known ocean and sea depths explorer Jacques Cousteau. Are you or not biology and geography fan, you need to visit this museum; this view is fantastic (entrance ticket 10 EUR). Museum is 5 floors, from which 2 are under the ground, where are big aquariums. In there are small fishes and sharks. There are wide sea fauna and flora collection, materials from expeditions. If you know French language, then in other hall you can see movies from these expeditions and hear the stories about them. Near the museum is submarine, which seems to be not just raised from sea, but from The Beatles song yellow submarine too. Monaco name is known with Formula 1, Monaco Grand-Prix event, because they’re going in city streets, where normally are going people and driving cars. Photo you can see lower – fastest stage, slowest turning. Wherewith in Monaco is wide souvenir and different sportive relic choice for every F1 fan. A weekday city street seems to be about proud and not seen automobile exhibition place. 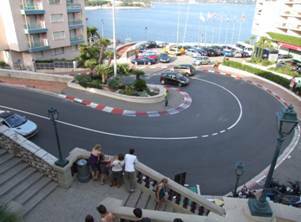 Monaco is known with its banks and Monte Carlo casinos, which are visited by world’s prosperous, popular persons. In the casino you need to legislate for that you will need to give every photo and video equipment to guards. Interesting fact is that Monaco inhabitants can’t play casino, because their incomes are not imposed with a tax. Casino halls are luxurious like in every castle, but bets were too high for us. We enjoyed limo parade, park with exotic trees and sea port with yachts. port forville monaco who lives there?